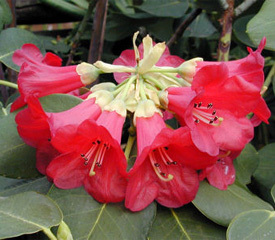 Flower/Truss Description: Campanulate, crimson to deep wine-red, fleshy, calyx conspicuous. Lax truss holds 3-12 flowers. Foliage Description: Leaves orbicular or ovate to elliptic, 2" to 4½" long.